"I am a reasonable libertarian." This is the second of three chapters of Separatism And Scandal: Maxime Bernier's Unlikely Road To Redemption. Bernier’s campaign platform is based primarily on the ideas he’s pitched for nearly a decade — two decades if you consider his writings at the Montreal Economic Institute. Over time, he’s changed his policies on certain social issues. In 2006, he voted against gay marriage, saying his constituents didn’t support it. But at last year’s Tory convention, Bernier was one of the MPs speaking in favour of striking the party’s definition of marriage as a union between one man and one woman from its official policy book. (If the issue comes up in Parliament, Bernier says he’ll let MPs have a free vote). Last fall, Bernier also supported Bill C-16, legislation that expands the Canadian Human Rights Act to transsexual individuals, by including protection against discrimination for gender identity or gender expression. “I voted for because I voted against discrimination,” he explains. Shortly after, however, Bernier spoke with University of Toronto psychology professor Jordan Peterson, who convinced him the bill would hurt freedom of speech. Bernier wrote to the Senate, telling them he had made “a mistake” and urging them not to pass the bill. As a junior minister, Bernier was unafraid to stake out positions without the PMO’s blessing. He supported an NDP bill that would ensure that agents of Parliament are bilingual (something the Tory heritage minister James Moore had initially opposed). “Oh boy, I got slapped on the wrists for that,” he recalls. He also came out boldly in favour of a referendum on abolishing the Senate. More controversially, perhaps, Bernier remains a climate skeptic. He believes “climate change exists” but maybe not that humans cause it. “I’m not a scientist,” he begins to explain. “I know that the majority viewpoint quasi-unanimous is that humans play an important part in climate change and in the production of greenhouse gas emissions. Another scientific thought, which is a minority viewpoint, I must admit it, very minor, that says it is mostly caused by the sun. 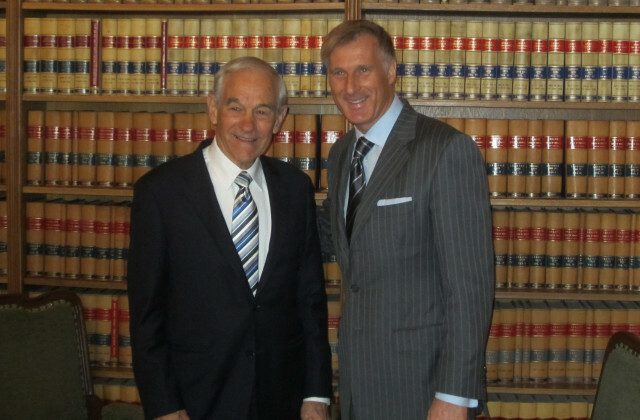 Maxime Bernier poses with U.S. libertarian icon Ron Paul. What he’ll do about it is scrap any federal carbon tax and hand out research and development credits. “Something like that that will help them to develop technology to fight not only climate change but pollution when they are producing a good or manufacturing something,” he says. Bernier’s campaign is based on four themes that roll off his tongue: individual freedoms, personal responsibility, respect, and fairness. While he isn’t championing a flat tax, what he calls his $30-billion tax plan includes two taxation brackets: a federal tax of 15 per cent for incomes ranging from $15,001 and $100,000, and a 25-per-cent tax rate on income above $100,000. "No, I won’t have a stimulus package because for me, it is not a stimulus package, it is a sedative package." He plans to drop the corporate tax rate to 10 per cent from 15 per cent and says he’ll abolish all loans and subsidies to the private sector. He will also eliminate the capital gains tax and expand the accelerated capital cost allowance, giving businesses in all industries a three-year depreciation on new investments. Even in heavily subsidized industries such as automobiles and aerospace, Bernier won’t go toe-to-toe with foreign jurisdictions to keep local jobs. Bernier doesn’t believe spending money will create wealth or jobs, so he’s rigid in his policy prescriptions. If there is a recession, Bernier won’t show flexibility. Bernier plans to balance the books in two years. With deficits projected to be in the $15-billion range, and tax plan that The Globe and Mail’s Campbell Clark estimates is between $42 billion to $47 billion a year, Bernier would have to cut $60 billion — one-fifth of all government spending. “That would mean cutting at least the equivalent of the Department of National Defence — the army, the navy and the air force — and at the high end, it would be like cutting all federal health-care transfers to provinces, plus the departments of transport and natural resources,” Clark wrote. Bernier says tough decisions will have to be made, although he gives no specifics about what he’d cut. His first budget, he says, will be pro-growth, abolishing corporate welfare and using the money to lower the corporate income tax and killing the capital gains tax. Only after the budget is balanced and he’s running surpluses in the third and fourth budgets, will Bernier cut personal taxes. After shrinking the size of government in Ottawa, Bernier plans to reshape the Canadian federation. He’ll tackle inter-provincial barriers once and for all by suing provinces over laws and regulations that impede the free for of goods across the country. I move the conversation towards equalization. Bernier doesn’t think Quebecers will respond with outrage. None of what he’s saying should be new to them, he says. Bernier would also use the equalization formula to offset some of the big changes he wants to bring to health care. The Quebec MP wants to eliminate the federal government’s role in health care delivery by transferring tax points to the provinces. In order to ensure a similar level of services across the country, so poorer and smaller provinces are not disadvantaged, Bernier will use equalization money to give them more cash. “The Constitution has the solution!” he enthusiastically declares. The Canada Health Act will remain to ensure universal coverage in a public system. If his reforms result in more private health care, so be it, he says. The provinces will choose. His most well-known policy is the call to abolish supply management, where domestic production is set by quotas and imports restricted through tariffs. Proponents of the system say it helps support Canadian dairy, poultry and egg farmers without government subsidies. Bernier calls it a “cartel” that leads to higher prices for consumers, to the tune of about $500 each a year. Getting rid of the system won’t be cheap. Two challengers, Steven Blaney and Andrew Scheer, say it would cost taxpayers $30 billion to buy back the farmers’ quotas. Bernier suggests a tax on milk to help pay for the quota will be short-term pain for long-term gain. Tackling supply management is a key plank of his campaign, designed to show Bernier skeptics that the candidate is ready to walk the talk. His riding has the third largest concentration of dairy farmers, and many, livid, have bought Conservative party memberships just to vote against Bernier. Bernier’s position won’t likely affect his electoral chances — “his majorities are much too big,” Marcoux predicts. The MP himself estimates only about 3,000 to 5,000 votes out of more than 80,000 would be affected. But when the leadership votes are tallied on May 27, most Conservatives in Beauce may show a clear preference for someone else to lead the Tories. Bernier’s belief that more competition will lead to lower prices and better services also extends to promises to dismantle the Canadian Radio-television and Telecommunications Commission (the broadcast regulator) and to remove all foreign ownership barriers for airlines and wireless companies. He also plans to privatize Canada Post, as well as Canada’s airports. Bernier stops short, however, of calling for the sell-off of the CBC. “We need a public CBC and Radio-Canada,” he says. He thinks it is important that the public broadcaster remain in small communities to tell stories in both official languages, and he wants to see more foreign correspondents. He says he was upset that the broadcaster responded to a Tory-ordered budget cut of 10 per cent by slashing jobs in smaller regions. CBC/Radio-Canada should focus on fulfilling its mandate and not competing with the private sector. He wants to remove ads and ban CBC from producing what he calls “kitchen shows” that are available on other networks. For revenue, he envisions “a kind of PBS model” with federal support. On immigration, Bernier wants to accept fewer newcomers and pursue a policy that puts a priority on economic immigrants. His target is 250,000 immigrants a year. (The Liberals’ current goal is 300,000). “But if the private markets want more economic immigrants, we will be able to increase that,” he says. Under his leadership, the federal government would scale back its role on refugee sponsorships and leave the bulk to private sponsors. He says he’s not trying to keep Canada Anglo-Saxon or looking for immigrants who will melt more easily into Canadian society. “No, absolutely not,” he responds, when I ask. He points to the number of cultural minorities backing his leadership bid. “We have a lot of people with other faiths in Canada, and that’s great,” he says. The irony of Bernier’s comment seems to be lost on him. It was Trudeau’s father, prime minister Pierre Elliott Trudeau, after all who enshrined those freedoms in the Constitution 35 years ago. Bernier is opposed to challenger Kellie Leitch’s plan to screen new immigrants but he wants to give Canadian border guards, CSIS and the RCMP more resources to perform background checks and interviews, if necessary. In order to stop the flow of migrants across the Canada-U.S. border, Bernier says he’d sit down with U.S. President Donald Trump and negotiate an amendment to the Safe Third Country Agreement to ensure that regardless of where individuals cross — at official border crossings or unofficial fields — everyone is treated the same. “We need to ensure the legitimacy of our borders and the legitimacy of our immigration system,” he says. In March, Bernier, along with most of the Tory caucus, voted against M-103, a Liberal motion condemning Islamophobia and all forms of systemic racism. He says he opposes the proposal because it singles out one religion, does not include a definition of Islamophobia, and stifles freedom of speech. Everyone has the same right to say what they want — even Muslim clerics who say inflammatory things about non-believers, Bernier suggests. As popularized by the movie, the red pill represents freedom and sometimes painful reality, while the blue pill represents blissful ignorance. At the same time, the “red pill” concept has been adopted by men’s rights activists who argue women really want dominance instead of equality. It’s also the name of a misogynistic — and popular — subreddit. Bernier denies knowing anything about the red pill’s other meaning, but he refused to delete his tweet when Twitter users noted the misogynistic link and wondered if this was also dog-whistle politics. Masse considers this the only controversy of the campaign. So why not delete it? I change the topic to pot. “I haven’t read it yet,” Bernier says of the Liberal legislation tabled in mid-April. He’s been busy on the road. He expects the Tories to table amendments and if they aren’t accepted, he won't support the Grits’ bill. This is second of three parts of Separatism And Scandal: Maxime Bernier's Unlikely Road To Redemption.